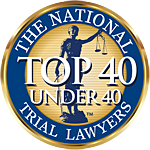 Attorney Anthony A. Mahan was recently awarded the honor of Top 40 Under 40 in Kentucky by The National Trial Lawyers, a professional organization composed of the top trial lawyers from each state who are younger than the age of 40. Having gone through the veterinary start-up process previously I was aware of the complexities and costs it would take to get my practice open. Two years prior to working with Mr. Mahan I contacted a reputable law firm and paid $2700 to negotiate a lease contract that I did not execute. That was just to review the lease. This time around I needed another option, I wanted a lawyer that was affordable and available for all my needs. Mr. Mahan's monthly payment plan provided me with the financial flexibility to start the process but also gives me access to his knowledge. With the agreement in place I am not reluctant to reach out to Mr. Mahan for any legal or contractual questions that I may have. The service has been indispensable and also saved me from erroneously spending capital that I am simply not in a position to spend. Mr. Mahan has been a large part of my venture from the beginning and I will lean on him for years to come. Tony was the best lawyer ever. He was my first experience with a lawyer and he made me feel informed and knowledgeable about what was going on. He attacked every challenge no matter the size. He is very educated, nice, and humble. Would recommend him to anyone!